Those of you who have been following my recent posts about digital currencies may remember my recent discussion with Alex Tapscott, founder and CEO of Northwest Passage Ventures. He’s the co-author along with his dad, the business theorist Don Tapscott of the best selling book ‘The Trust Protocol: How Blockchain Technology Will Change Money, Business and the World. ” In my last post, we delved a little into the topic of blockchains, those public ledgers that allow digital currencies like bitcoin and others to be sent to others as a form of payment. Here, Alex discusses the different forms that a blockchain can take. “There are lots of different ways to make a blockchain, with some being public and some private, and a lot of times people don’t really know what that means,” Alex said. “Basically a public blockchain is simply one that is open and permissionless, where anybody can access it regardless of where they are or who they are. Alex acknowledged fears that cryptocurrencies might be hacked, with bitcoins or other currencies actually stolen, but said public blockchains help mitigate the risk. “The more different people you have, the more distributed it is, which generally speaking reduces the chance of attack, because you have to attack many computers rather than one computer. Also, because you’ve got lots of different computers, there’s more energy and more computing power going into this blockchain, which makes it more secure for the most part. By contrast, Alex noted that private blockchains are made up of participants who have permissioned access. 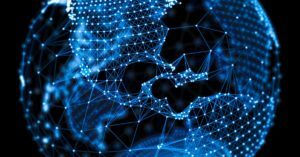 And with fewer participants a private blockchain can manage a higher transaction volume, he said. “And it can manage more types of transactions, too, because the rules are set by the participants, and they can change the rules to meet different types of assets. Everyone trusts each other somewhat, and can trust that they each have the necessary computing resources to manage the blockchain. That means it’s unlikely that someone won’t have the ability to participate fully. In future posts, we’ll delve into a lot more about the future of cryptocurrencies, including setting up private blockchains, regulatory aspects, security and more. Watch for it!